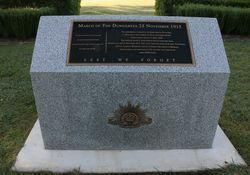 The monument commemorates the March of the Dungarees in November 1915 during World War One and members of the re-enactment march which passed through the area in April 1988. 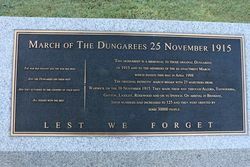 The Dungarees were answering a call for troops from Australian Prime Minister Billy Hughes following the shocking loss of life and casualty count from Gallipoli. Patriotic marches were probably one of the most spectacular and successful ways of attracting young men into the services. Potential recruits were canvassed from towns and rural communities. Ten such marches were conducted, the first - and most famous - being the Cooee March which began in Gilgandra, New South Wales, in October 1915. The south-east Queensland march followed the Cooee example. Leaving Warwick on November 16, the Dungaree march made its way through Allora, Clifton, Greenmount, Cambooya, Toowoomba, Helidon, Gatton, Laidley, Rosewood, Ipswich and Oxley. The 270 kilometre march ended in Brisbane, with 125 young men arriving to a tumultuous civic reception. Warwick on the 16 November 1915. They made their way through Allora, Toowoomba, Gatton, Laidley, Rosewood and on to Ipswich. On arrival in Brisbane, their numbers had increased to 125 and they were greeted by some 30000 people. All heroes with the rest.